Andluca is making glass smarter and more efficient without compromising design. Andluca Technologies designs transparent, thin-film power sources that convert ultraviolet light into useful energy at the point of use. These thin-film power sources disappear into their environment to enable discreet, wireless operation of smart windows and IoT devices. Beyond buildings, our technologies are unlocking new functionalities in the automobile, aviation, military, eyewear, and medical sectors. 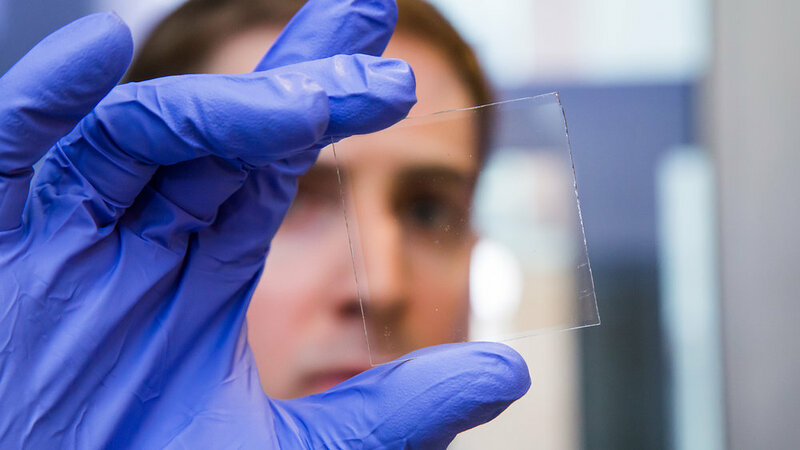 Andluca Technologies was established in 2017 following over 12 years of research on light-responsive films by Professor Lynn Loo and her team at the Organic and Polymer Electronics Laboratory at Princeton University. ExxonMobil is partnering with Princeton’s Andlinger Center for Energy and the Environment, one of several premiere university Energy Centers, to research how the world will meet future energy needs. Just past violet, no longer visible to the human eye, comes ultraviolet, those powerful rays that have a frequency even higher than violet light. In a first-of-its-kind solar technology, Princeton University scientists have found a way to harness near-UV light and use it to power smart windows. Even when shut, windows let in the sun’s light and warmth, which we usually welcome. But sunlight can fade our carpets or wake us up when we’d rather nap; the sun’s heat is sometimes too much in summer; and windows can be peeped into. Some modern windows can block light and heat with the touch of a button, but such “smart windows” usually require electricity, making them expensive and hard to retrofit. Now scientists at Princeton University have invented a technology aimed at smartening up the millions of windows already in place. Smart windows equipped with controllable glazing can augment lighting, cooling, and heating systems by varying their tint, saving up to 40 percent in an average building’s energy costs. These smart windows require power for operation, so they are relatively complicated to install in existing buildings. But by applying a new solar cell technology, researchers at Princeton University have developed a different type of smart window: a self-powered version that promises to be inexpensive and easy to apply to existing windows. This system features solar cells that selectively absorb near-ultraviolet light, so the new windows are completely self-powered.